Hallelujah, we have progress happening at the cabin! One more room is officially in the books and I have to say, it is starting to feel SO good to watch this place come together. I’ll be honest, when we first purchased this home, I was having the hardest time creating a true vision for what I wanted it to look like, feel like and especially how it was all supposed to weave together and feel cohesive. Now that the the master bedroom is the second room completely done [our first room being the guest bedroom which you can see here] I feel like it’s taking shape and coming out better than expected. When it came to tackling the master bedroom, we immediately turned to Macy’s as we’ve redone two bedrooms recently with them and are always beyond happy with our furniture and furnishings that we’ve selected from their home department! Of course, you can’t beat the price [especially now thanks to the Macy’s 4th of July Event happening now through July 8th! Use code FOURTH to receive an additional 20% off items + free shipping at $49!] and the quality has been exceptional! Shawn now requests I first look at Macy’s before anywhere else when it comes to all home things. I can’t say I’m mad about it. Today I wanted to share ALL of the details on what we did in this space and let you see how it all came together. If you’re in the process of redoing a bedroom, hopefully this post is helpful to you! Before we look at the room and how it stands now, we must first take a look back to see what we started with…. As you can see, we changed things quite a bit, starting with paint. For the drywalled walls, we painted Benjamin Moore Revere Pewter at 50% to keep things light and airy knowing we were going dark on the wood walls. On the wood, we painted Sherwin Williams Iron Ore which is almost black and a color I currently can’t get enough of! I was nervous to go this route, however, as soon as I saw it on the walls and in this room, I felt 100% confident in the decision. It is a great contrast to the wood beams on the ceiling and think it’s such a masculine yet still soft enough vibe. 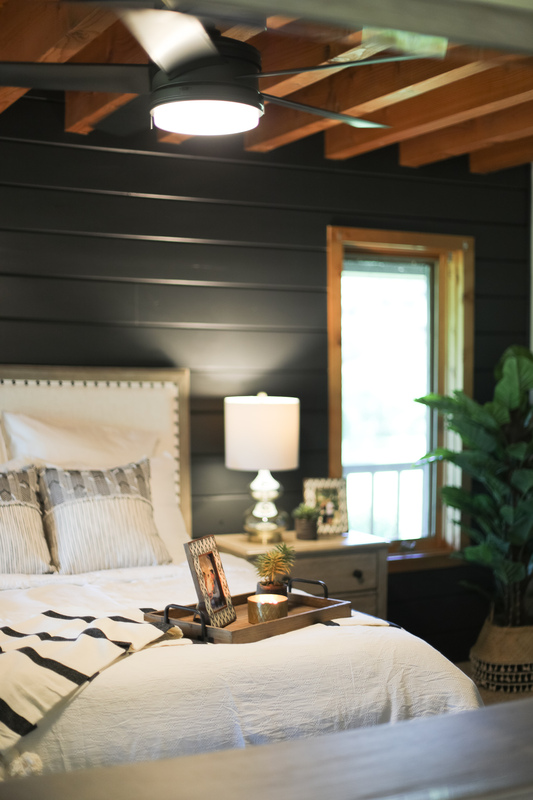 Black shiplap for the win! For the furniture, when I spotted the Parker collection, I knew it had to happen. I love the upholstered bed with the grommet details. The light linen fabric stands against the dark walls beautifully and the distressed natural finish of the wood is so easy to place in nearly any space. We have a queen size bed in this room for reference. One question I’ve been receiving is when it comes to placing a rug under a queen bed, what size should you go with? For this room, I chose this Loloi Emory Eb-09 Black/Ivory 7’7″x10’6″ Area Rug and it fills the space perfectly! We went with the Parker 8 Drawer Dresser and Parker Mirror along with the Parker USB Power Outlet Nightstands to finish up the furniture in this room. I feel so 21st century with USB nightstands. LONG LIVE TECHNOLOGY. Tucked away in the corner next to the window is this pop of color chair to hang out on [but mostly to just sit there and look pretty ;)] I imagine me attempting to read a few books in this space with little hope of accomplishing, but it’s the thought that counts. It is a deeper teal in person than it shows in this light and gives a rich look to this space. A few other quick items to note and then we’ll have the room covered! This Adesso Benson Tripod Floor Lamp completes the back corner by the window and lights things up beautifully. When it came to choosing the bedding, I wanted something light and bright [we’ll see how quickly I regret that decision #dogs] and went with this Lucky Brand Ventura Waffle 3-Pc. Full/Queen Comforter Set and AQ Textiles Devon 4-Pc. Queen Sheet Set, 900 Thread Count in White which looks super polished and clean against the darker wood walls. And that completes our master bedroom reveal! Thanks for taking this little tour, come back soon as we reveal the next room in the log cabin adventures…[follow along here for more progress!] Don’t forget to check out Macy’s for all of your home needs as you work on making your house a home and remember to use code FOURTH for that extra 20% off now through July 8th! Looks great! Your instincts were right on with the iron ore color! We’ve just purchased a house that needs A LOT of updating so I’m definitely taking notes on all your finds/ideas. I’ve never tried Macy’s for furniture, they weren’t on my radar for some reason, but I definitely will check them out! I absolutely love the wall colors. They definitely help the exposed beams to pop more. A stunning make over! The black wall would have given me major anxiety but it came out amazing! Beautiful! Where did you get the tray on the bed?! Looking for something just like that! Gorgeous! The colors in the room are amazing! Where did you get the large glass jug on your dresser? Beautiful! Where is your plant and the basket that it’s in from?! Your room is beautiful! Can you tell me where you purchased the ceiling fan? Thanks so much, Patricia! The fan is from Lowe’s! LOVE it! We are replacing all of our ceiling fans and wondering if the one you have is from LOWES? Can you share the paint color? It is great! Ordered the same bed and nightstands from Macy’s last week! (Of course took advantage of the sale pricing you mentioned) Had a vision of what I wanted for my master but haven’t been able to find it anywhere until I saw your remodel. Arriving on Thursday! Thank you!